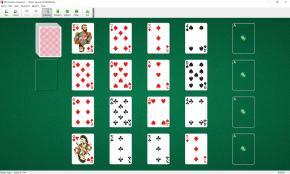 British Square Solitaire uses 104 cards (2 decks). 16 tableau piles are placed on the board in the form of 4 x 4 square. One card is dealt to each of the 16 tableau piles at the start of the game. You also have 4 foundations. One Ace of each suit is placed on each foundation pile during the game as the starting card. Build each foundation up in suit to king, then add a duplicate king and then build them down in suit to aces. The top cards of tableau piles and the waste pile are available to play. You can build tableau piles up or down in suit (but you may not change direction in the same pile). Only one card at a time can be moved from pile to pile. Spaces are filled automatically from the waste or stock.